Well, the exhaustion has definitely set in for some of our performers! But this is to be expected around February – because February in Perth means Fringe World! Fringe World this year was huge. With more than 500 shows and 100 venues, Perth had a lot to choose from. Retro Music Box were super proud to see four of their acts not only feature as part of Fringe World this year, but play to sell-out crowds AND earn award nominations! 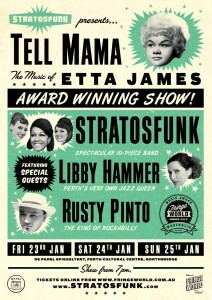 After selling out audiences and taking out the award in 2013 for Best Music Show at Fringe World, Stratosfunk brought Tell Mama: The Music of Etta James back to Fringe World 2015. Perth audiences and Stratosfunk fans could not get enough of this show – the limited 3-night season completely sold out days before opening. They even scored another nomination for the 2015 Music & Musicals award! Stratosfunk also played a hot and steamy (literally steamy, at 35 degrees in a big-top tent!) 60s soul and Motown night as part of Fringe and Summerset Festival at Scarborough’s Sunset Verandah, and were honoured to receive another nomination and take out second runner up for the 2015 Music & Musicals award. 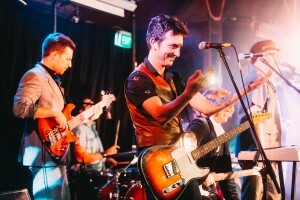 Two award nominations were bestowed on hard-working band The Darling Buds of May at this year’s Fringe World, for their shows The Swing Revue and Fever: The Music Of Peggy Lee. The Swing Revue was back for a third time, featuring The Darling Buds of May backing this year’s special guests; jazz songstress Ali Bodycoat, rockabilly king Rusty Pinto (Shotdown From Sugartown), Retro Music Box harmony darlings the Cottontail Trio and the newly formed vocal quartet The Concept Of West. The show was an absolute riot, with more swing, harmony and crazy high jinx than you could poke a stick at. Check out some videos of past years below. Fever: The Music of Peggy Lee premiered to a sold-out crowd as lead singer Jessie Gordon crooned her way through many of the hits and a few of the rarities made famous by Peggy Lee. Read a fantastic 4.5 STAR review of the show here! 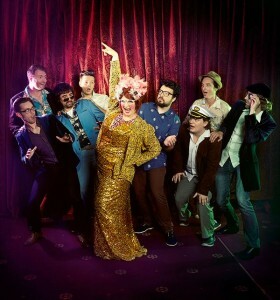 The smooths sounds of the late 1970s and early 1980s infiltrated Fringe World this year when Some Like It Yacht debuted their self-titled show at the De Parel Spiegeltent. Teaming up with ‘Perthonality’ Famous Sharron, SLIY presented a show full of special guests (including Stratosfemmes Amy Rosato & Jessie Gordon), big laughs, audience interaction, and most importantly, Yacht Rock. The Saturday night all-guest spectacular was the highlight of the season; the sold-out crowd were up dancing and singing every lyric, and earned SLIY a nomination for Best Cabaret show. Special mention must go to Jessie Gordon, for performing 48 shows in 28 days as part of Fringe World, and for her part in Perth Cabaret Collective’s show Speak Easy, which won the WA Best Cabaret award! Be sure to sign up to our Retro Music Box mailing list to stay in the loop for 2016 Fringe World craziness. It’s a pretty safe bet that many of our acts will be involved again!